According to ASHRAE research, GSHP units have a service life expectancy of more than 24 years. 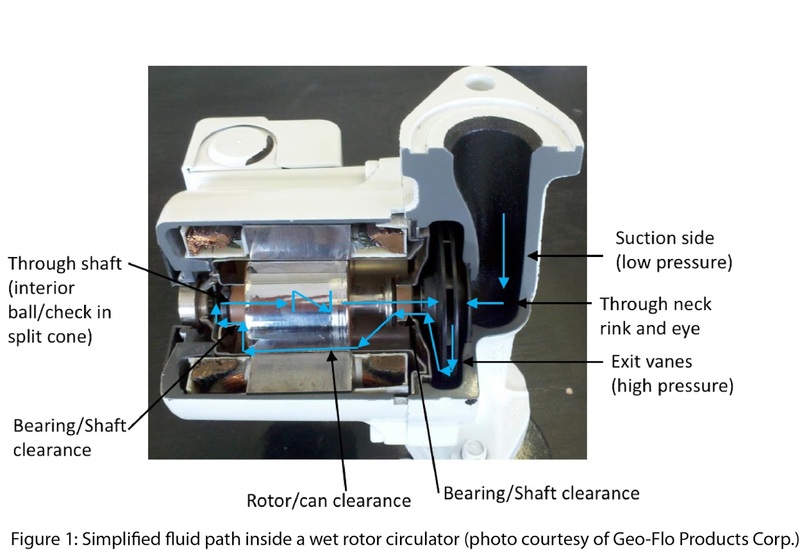 At 10 years, the average service life of a wet rotor circulator pales in comparison. Geo-Flo recently conducted a review of the warranty claims they received due to pump failures. The data suggest that the majority of premature pump failures are due to preventable issues. 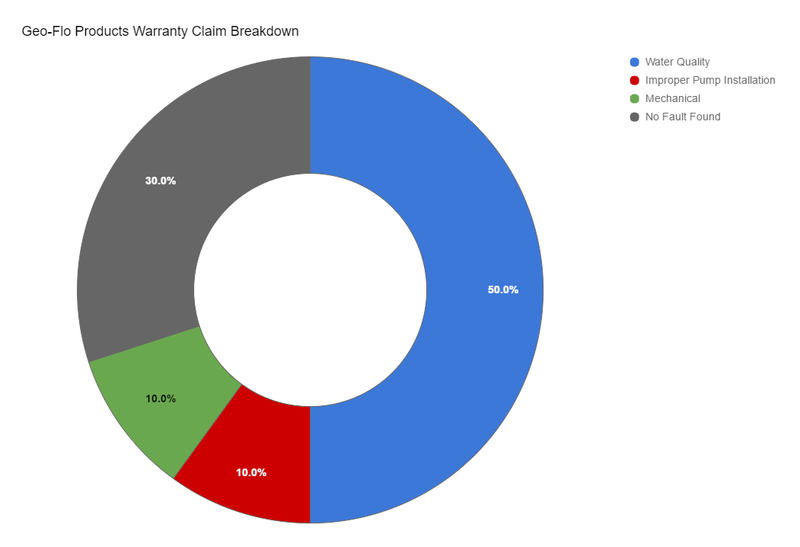 The chart shows the breakdown of warranty claims in the analysis by Geo-Flo. As illustrated, only 10% of failures were due to mechanical issues. The majority of failures were due to preventable problems. 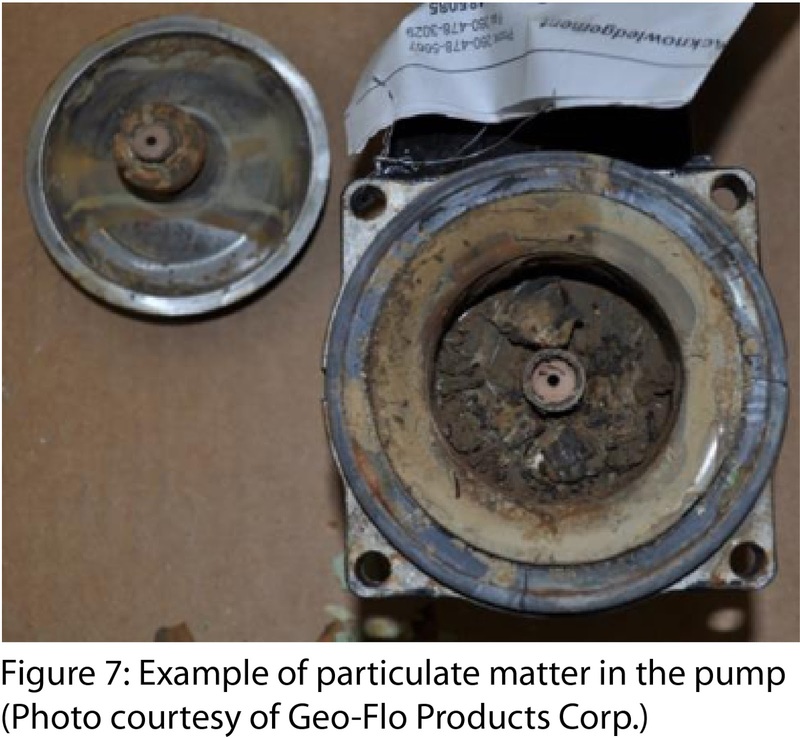 Poor water quality accounted for half of the failed pumps and improper installation practices contributed another 10%. The simplest thing to do is to use a filter when flushing the system prior to startup. Particulate matter such as fine sand or clay can build up in the small passageways and can even erode internal pump components. Typically, a 100-micron filter during flushing is sufficient to remove pipe shavings and other debris that may have been introduced during installation. 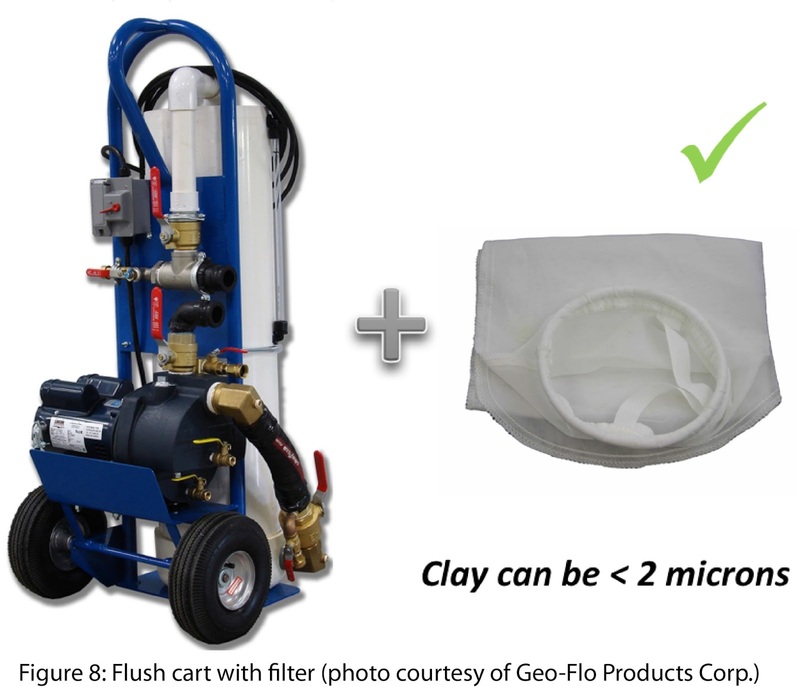 Keep in mind that silt and clay particles can be smaller than 75 microns. Once air is purged from the system, a finer 1-micron filter should be used to reduce the potential for sand, silt, and clay to eventually end up in the circulating pump. Although filtering is essential, it doesn’t address bad water chemistry. Water quality is the most critical factor in how a pump performs over the life of the system. While bronze or stainless steel volutes will stand up to poor water quality better than cast-iron, they don’t solve the real problem. With a simple volute substitution, the pumps will last longer but the rest of the system (including the heat exchanger in the GSHP) is still exposed to bad chemistry and could fail instead. Municipal water systems and well water may not have proper water chemistry and can be detrimental to system longevity. In some cases, it may be best to transport treated water or a pre-mixed water and antifreeze solution to the jobsite. Take care to properly flush and purge the system prior to startup (remember that filter). Include an expansion tank or fluid reservoir above the pump suction with a pressurized flow center. Include pressure and vacuum relief components with a non-pressurized flow center. In general, electricity and water don’t mix. The terminal box needs to be located so that condensate from the ground loop piping can’t drip onto the electrical connections. Also, cold loop temperatures may create the potential for condensate to form inside the pump itself. If the pump housing floods, water will contact the electric connections and create a short. This is why circulators used in GSHP applications include condensate drain holes. Circulators that do not have condensate holes (such as those used in boiler applications) are not suitable for geothermal applications. Coated motor windings are recommended to extend pump life, especially in cold climates where condensation is a concern. They protect against damage due to moisture, corrosion, vibration, etc. Generally, a pump with coated windings will be more durable. Water flow through a pump needs to be in the vertical plane, which requires the pump shaft to be horizontal. Similar to an air-locked pump, a vertically-installed pump shaft can lead to eventual failure caused by the top bearing running dry without cooling or lubrication. When in doubt, refer to the pump installation manual provided by the manufacturer, which will address the majority of these issues. Use these tips while following manufacturer guidelines to extend pump service life, lower overall life cycle costs and increase customer satisfaction.